The "Slide Mounted Electronic Sight" or as it is more commonly referred to as "Micro Red Dot Sight" is a small electronic sight that is mounted just in front of the rear sights. 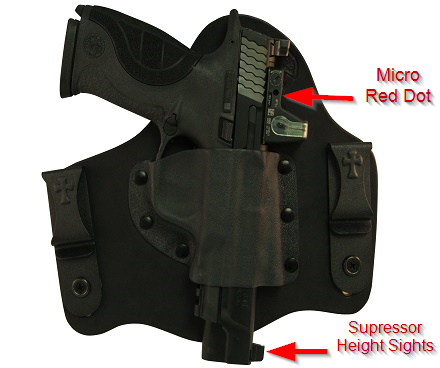 The SnapSlide or MiniSlide holsters come in three configurations. Each is a little different in terms of the amount of leather that will keep the grip and slide of the firearm off of your body while carried. Please refer to the diagram below for configuration options. The SnapSlide is an outside of the waistband holster designed to keep your firearm close to your body. This belt slide-style holster has belt slots that measure 1.75 inches; this works best with a 1.5 or 1.25 inch belt. The design is to have your firearm high and tight, just behind the hip on your strong side, and lay flat for concealment under a loose shirt. Available in our Black Cowhide, Founder's Leather and our Natural Tan Horsehide. Other options include a Sweat Guard or Sweat Guard with Combat Cut and Designer Series color Kydex. 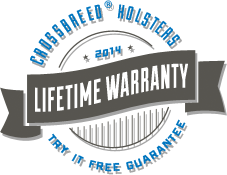 As with all of our hybrid holsters, the SnapSlide comes with a two week try it free guaranty and a lifetime warranty. Product Size: 7.5" x 1.5" x 6.75"